When I feel low, I often spend a day in Utica. A once-forsaken rust-belt city in the Mohawk Valley may not seem like a cure for depression, but it is and I have taken its welcome for granted for too long. My first summer away from home was spent stranded in Utica. I worked in a garment factory until my ineptitude at the sewing machine put an end to the checks. Without a way home, I spent as much time as I could at the Art Institute, day after day. In those days the original grass cloth wall coverings designed by the architect Phillip Johnson were still intact and their delicate texture and creamy color set off the paintings as he must have hoped. I could even mesmerize myself walking up and down the stairs to the second floor, looking at Johnson's stainless steel parallax stair railings. That was how I learned what a parallax was: an angle or inclination that shifts the relationship between two discrete lines. The three girls standing on the south side of Genesee Street, ready to welcome new comers on a cold night in December, look like girls I have met at the library, at the Refugee Center, or in Proctor's Park. This street is an important one, now as it was in the past; facing each other across its width are the Mohawk Valley Resource Center for Refugees and the Public Library and the Munson-Williams-Proctor Art Institute. Right here is the big heart of the city. Utica became a city because of the Erie Canal. Formally incorporated in 1832, railroads arrived the next year, and eventually the New York State Thruway cut through the north end of the city; all routes followed the path known as the Mohawk Trail. Utica built an impressive industrial economy from its natural resources - furniture, textiles, machinery, lumber (from the nearby Adirondacks) - and immigrants. Its history is not simple; the textile industry fed on the cotton imported from southern slave states, yet the city also became a major station on the Underground Railway during the 1850s. The jobs that left upstate New York for the South in the decades following World War II, are the jobs that are now leaving there for other countries. A once proud city of 100,000, Utica shrank to 60,000 by the year 2000. If there is one thing most people have heard about Utica's struggles it is the bumper sticker that read "Last One Out Of Utica, Please Turn Out The Lights." The original version of the familiar song we know as "Red River Valley" was originally about their river: "The Mohawk River Valley." 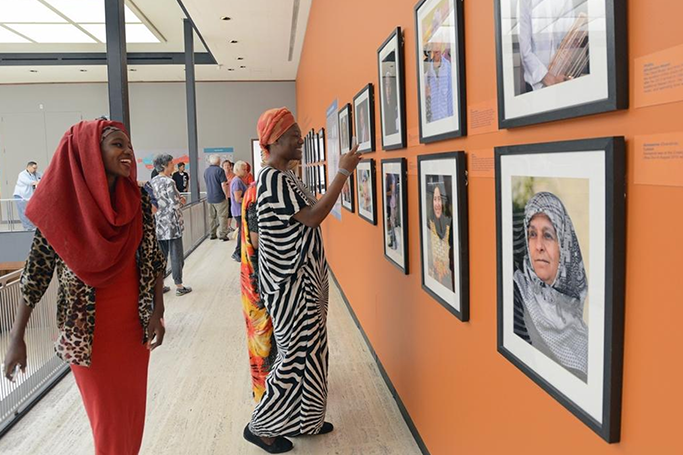 The future can never be found behind us so once again Utica opened its doors to refugees. Beginning in the 1970s Roberta Douglas and Catholic Charities made the city a haven for Amerasian children exiled as a result of the Vietnam War. Then in the 1990s, refugees from Bosnia-Herzegovina were welcomed, and then came Somali Bantus, Sudanese, Burmese Karens, Bhutanese, Nepalis, Russians, and now Latinos. All their journeys were long and difficult. Today, fully a quarter of the population is made up of refugees and their children. People came seeking sanctuary and stayed to make homes, rehabilitating run-down buildings, and starting businesses. This, too, has not been simple but it is good. As the man holding a hand-lettered sign on a cold December night last year bears witness: "Refugees Welcomed In Utica." Starting Over: Bhutanese-Nepali Refugees in Utica, NY by Kathryn Stamm, et al in Himalaya Journal, Hanover, New Hampshire..
- Office of the State Comptroller of New York, Honorable Thomas DiNapoli, Albany. 1. 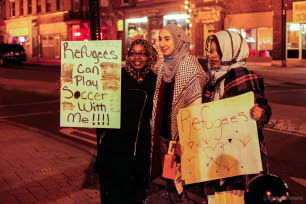 Refugees can play soccer with me - Love and Rage Media Collective, Utica, NY. 2. Bhutanese-Nepali residents of Utica, NY, Himalaya Journal, Hanover, New Hampshire. 3. 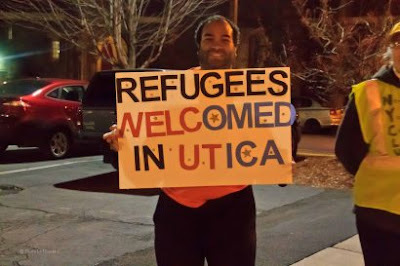 Refugees Welcomed In Utica, Love And Rage Media Collective, Utica, NY. 4. Tina Russell for the Utica Observer-Dispatch - Fadumo Ali, age 15 and Rica Akimeli at the Munson-Williams-Proctor Art Museum for the exhibition Portraits of Hope: Faces of Refugee Resettlement in Central New York , August 12, 2016. 5. Utica In Winter - courtesy of State of the Reunion. At last... some hope and some human decency, at least in Utica. The conservative Australian government is introducing legislation to ban asylum seekers who arrive by boat from ever being allowed into Australia. The ban will apply to any adult who has been sent to off-shore detention centres on Nauru or Manus Island since 2013. It means adults who have previously tried to enter Australia by boat since July 2013, but who have chosen to return home, will never be allowed to get a visa to Australia – even as a tourist, or a spouse. I am mortified to be Australian. Hels, keep heart. It's not Americans or Australians, it's humanity. That's what we need to hang on to and not debase it. I love your blog, Jane. It often serves as my meditation room. Thank you for all the hard work, care and love you put into your posts, and thanks especially for this one. I needed some hope on the "day after," and this definitely serves the purpose. Blessings to you. Welcome, Janet. I thank you so much for your kind words. This blog has become my online portfolio and I have received freelance assignments this way, as I used to do with a portfolio. That said, Utica is an example of a trend, I think. When we were children, the suburbs were the engines of activity; now the cities are taking that role. In the are where I live, the suburbs have so completely turned their back on their city, that our heart is being smothered. Smart hearts in the city! Kim, welcome. The wonder of Utica is that it is not a rich city, not in money. I wanted to quote from C.P. Cavafy's poem "Ithaka" but didn't. Here, now. "And if you find her poor, Ithaka won’t have fooled you. you’ll have understood by then what these Ithakas mean." I would like to add my name under Janet's comment, which says perfectly my impression. Thank you, Jane. Tania, I spent an entire summer stranded in Utica when I was young and broke. The museum was my haven. That's how I learned to play Bocce ball. It is an Italian version of boules or petanque. Wonderful Utica! You're spot on about the cities. I am happy to be back in a city. Couldn't imagine begin anywhere else at this point in time. P.S. I forgot to mention Utica has great beers! If you ever find yourself in Cleveland (another proud rust belt city) be sure to check out the 100-year-old Cleveland Cultural Gardens near the Museum of Art. A lovely celebration of the melting pot that is NE Ohio. 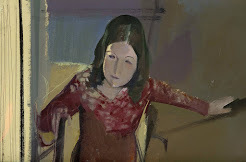 Best wishes for a New Year filled with fine art! Welcome back, Janet. I agree that our older cities have been undervalued for a long time. That is beginning to change for the better. Happy New Year to you.